No, these Sheepshead Bay ladies aren’t cooling their heels in the surf. 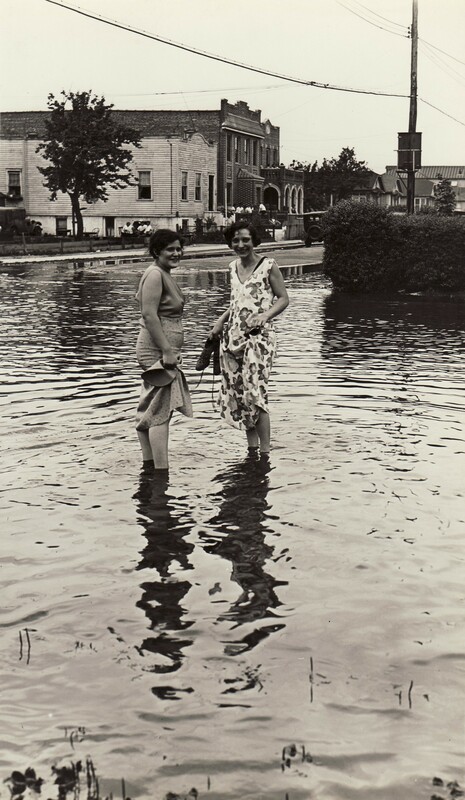 They are wading across the flooded intersection of Avenue Y and East 11th Street after a violent thunderstorm soaked the region on Sunday, July 9, 1933. The view is looking northwest (the frame house behind the tree is 2472 East 11th Street), with the ladies standing in the middle of Avenue Y, just two blocks west from where Squan Creek, a wiggly tributary of Coney Island Creek, once flowed freely through the grass. The early years of the twentieth century brought such drastic development to marshy southern Brooklyn that its newly asphalt-covered landscape could not cope with such sudden downpours. Let’s hope that in the 78 years since this photo was taken the sewers in our low-lying neighborhoods will be better equipped to drain off the rains of Hurricane Irene come Sunday.